Mark Bittman recently wrote an article for the NYTimes Magazine Food & Drink issue about alternative (healthy) fast food options and how the fast food industry has evolved and expanded as humans move into the ‘higher-expectations stage’ of their relationship with fast food. According to Bittman, Chipotle combines the best aspects of Nouveau Junk to create a new category that we might call ‘Improved Fast Food’ and sits in a tier the industry calls ‘Fast Casual’. 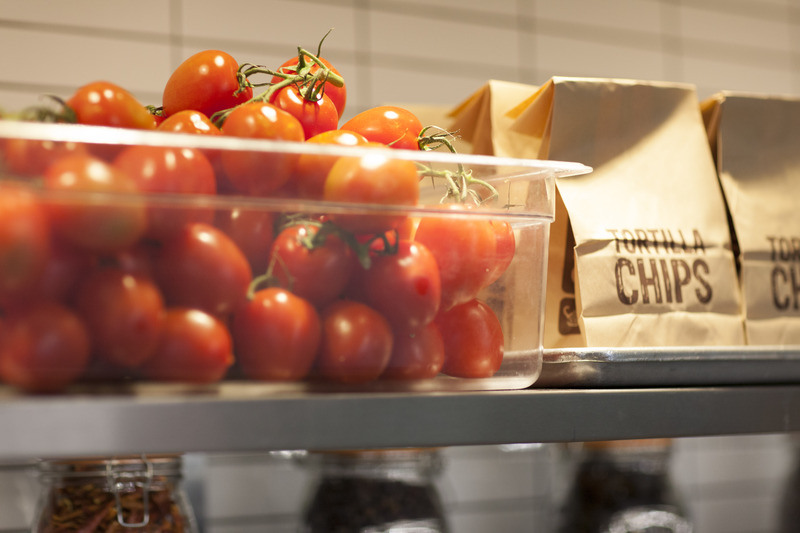 At Chipotle, the food is fresher and tastes much better than traditional fast food. 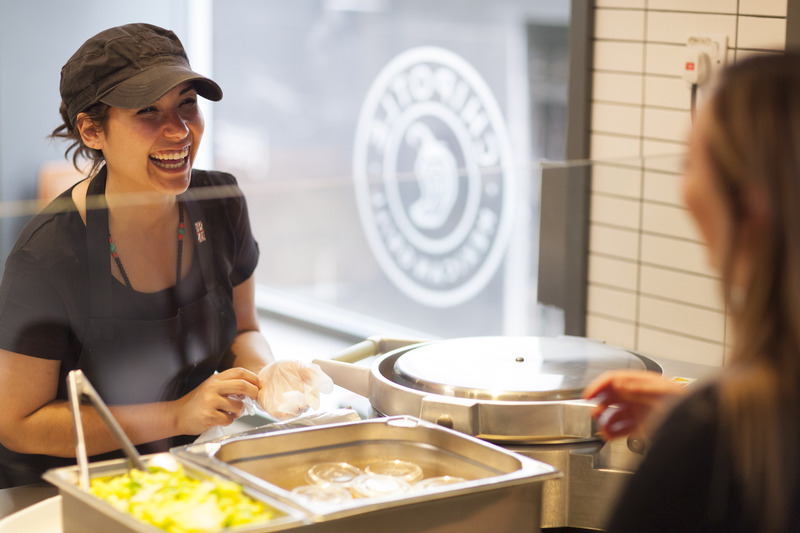 The sourcing, production and cooking is generally of a higher level; and the overall experience is much more pleasant – this is all part of what Chipotle calls ‘Food with Integrity’. I’m going to be frank – the quality of Mexican food in London is pretty paltry if not downright dismal. 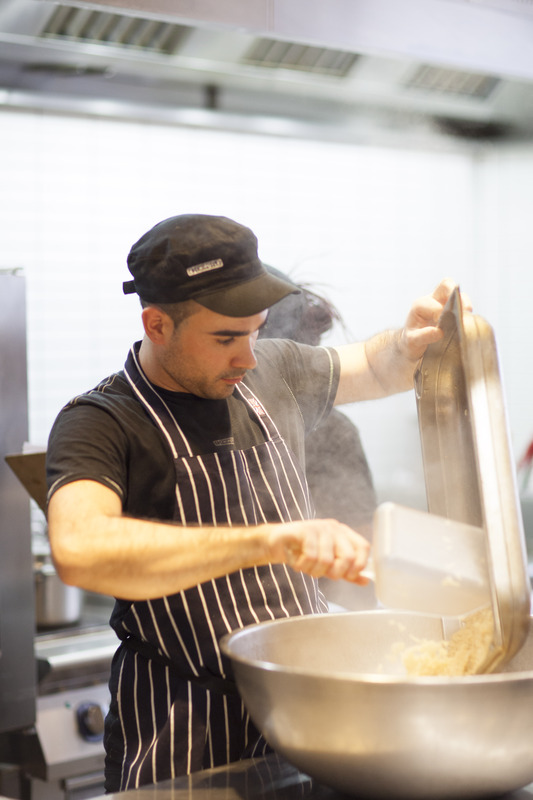 Coming from the States where there are so many good options for Mexican food and you can eat your way from one amazing Mexican restaurant to the next, it is difficult to come to terms with the sub-standard Mexican fare served in the fine city of London. It’s one terrible chain after the next of Wahacas (because it would be too difficult for people to pronounce O-A-X-A-C-A) and Tortillas with the occasional ‘decent’ option presenting itself like Boha Mexica in Shoreditch. When British people rave about places like Bodega Negra in Soho, my fears are confirmed that they have been seriously deprived of good Mexican food and suddenly I feel sad. It may sound strange to say that a ‘Fast Casual’ restaurant like Chipotle provides some of the best Mexican food you can get in London, but it is the truth. If you want a taste of the great Mexican food you can get in the States without actually going there (or Mexico for that matter), Chipotle provides you with that little slice of heaven – a respite in a city full of bad Mexican. The menu is simple: burritos (or as some might say, cylinders of deliciousness), burrito bowls, burrito salads, and tacos but this is all you need. As a faithful Chipotle lover/customer/fanatic, I decided to meet with the lovely apprentice manager, Anna, of the Chipotle branch on Charing Cross Road so that I could share with followers of the Ravenous Beast all the joys of Chipotle and well, spread the Chipotle love. 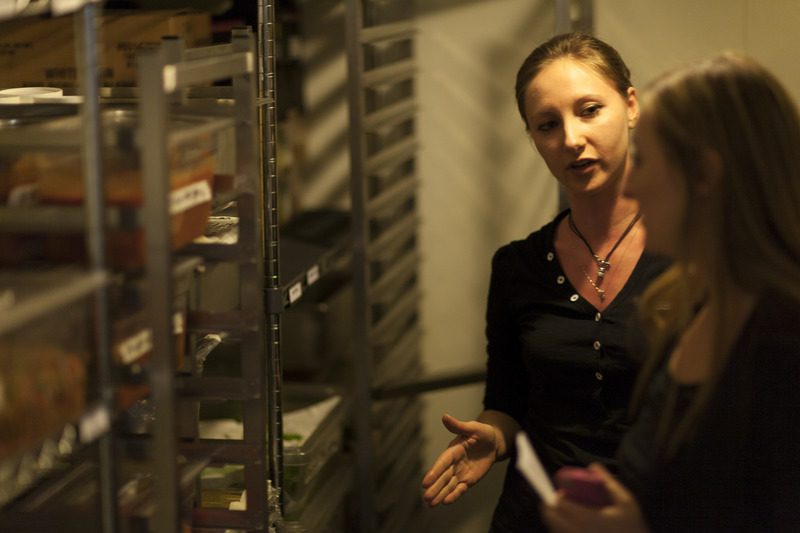 I arrive at around 14:45 when the lunch rush has died down a bit and Anna and the team can show me around properly. 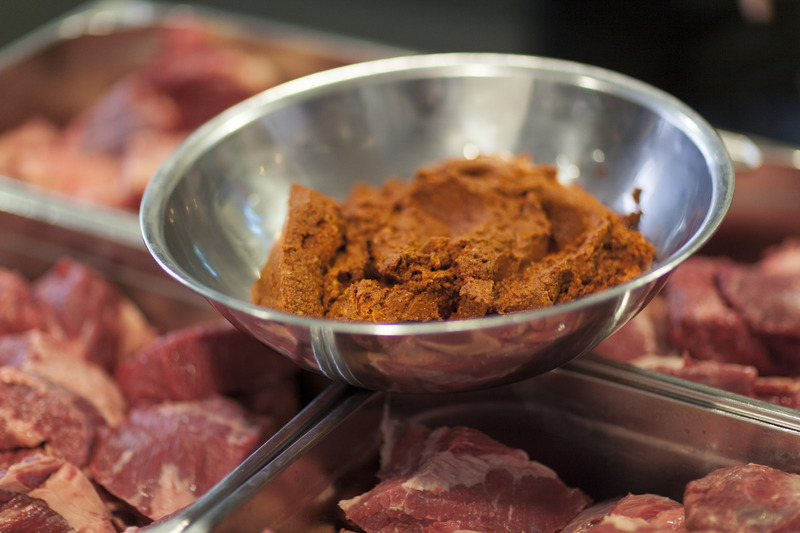 We immediately go into the kitchen where some beauteous barbacoa meat is marinating in bowls. Of course I ask Anna what it’s in the marinade and she can’t tell me as it’s a secret (dammit). She does divulge that the the barbacoa is marinated for 7 hours and the steak is marinated for 5 hours before rubbing in the spices and grilling. 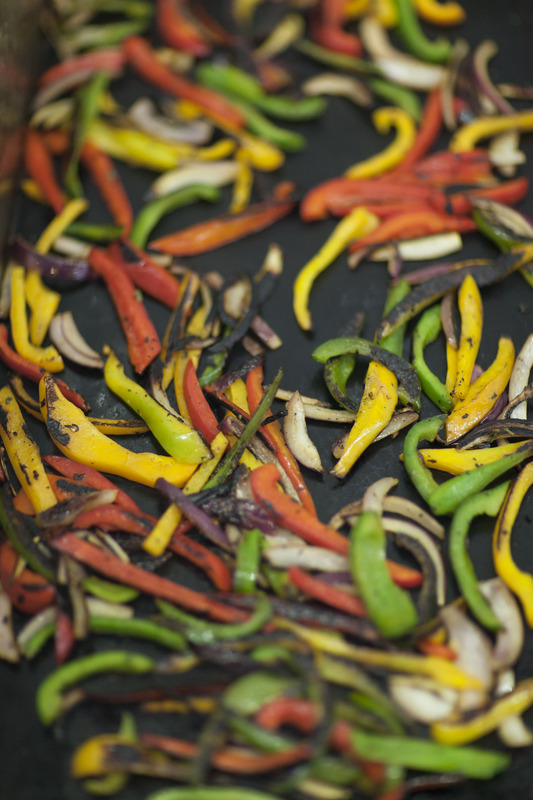 Food prep starts at 8am with the salsas and tortillas first – all the salsas are homemade on the premises with the onions, coriander, jalapeno peppers, etc. diced and prepared in the morning for the day’s customers. The tortillas are homemade as well, cut into triangles, fried, and then portioned out in the paper bags. 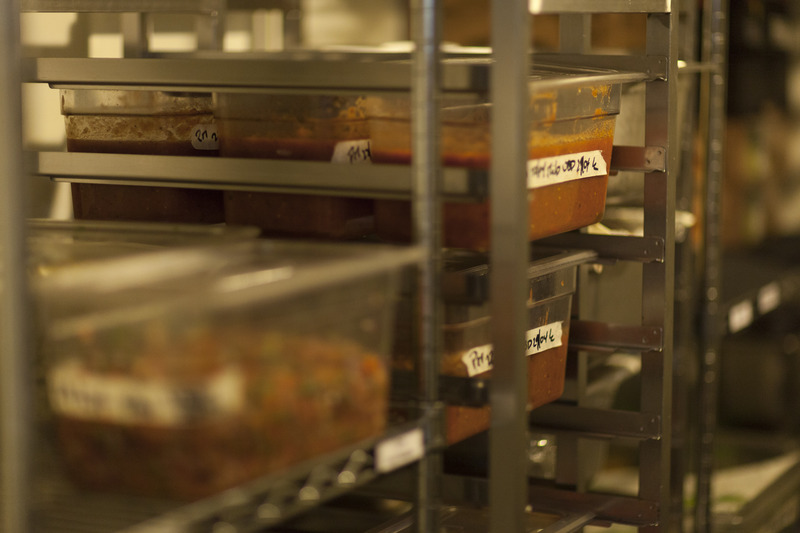 Anna takes me into the fridge where everything that has been prepared that morning is resting neatly in clearly labeled containers, stacked on the shelves waiting to be grilled or put out on the assembly line as needed. The fridge is surprisingly small yet orderly. Being the cheese fiend that I am, I inquire about the cheese mix of the Jack and cheddar and how the Jack is sourced as it hard to come by in London. 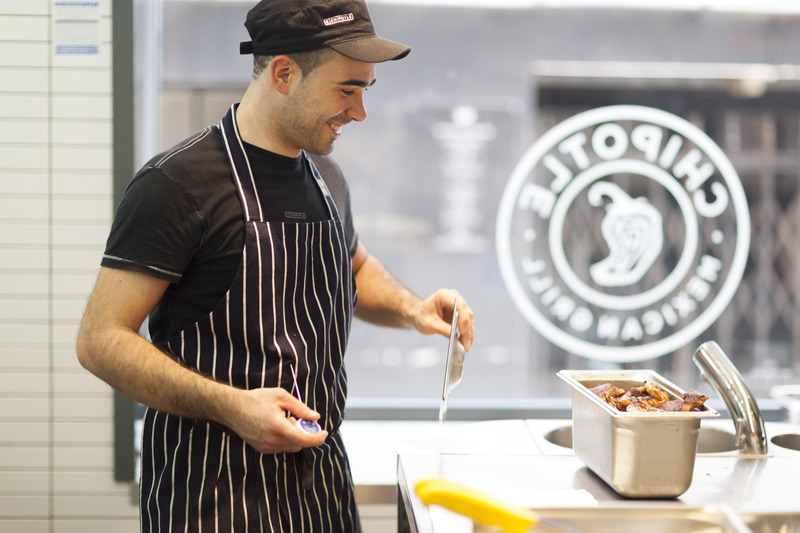 Chipotle is actually able to source the Jack cheese from within the UK – surprisingly it comes from Scotland. The cheese is delivered in huge blocks where it is then grated on the premises along with the cheddar. When I express my love for the fine, thin texture of the grated cheese, Anna informs me the right grater was extremely difficult to find as they wanted to get the texture of the cheese just right. While I am obsessed with cheese in general – in particular for the burrito it is crucial to get the flavor and texture of the cheese right. Most places such as Freebird Burrito on Berwick Street or Benito’s Hat use thick sliced cheddar cheese that you would put on a jacket potato. This is wrong on so many levels — the cheese has to be somewhat thinly grated so that it melts into the rest of the burrito ingredients and secondly, it also cannot be made from just cheddar – you need the milder taste of Jack to mellow out the sharper flavor of cheddar. 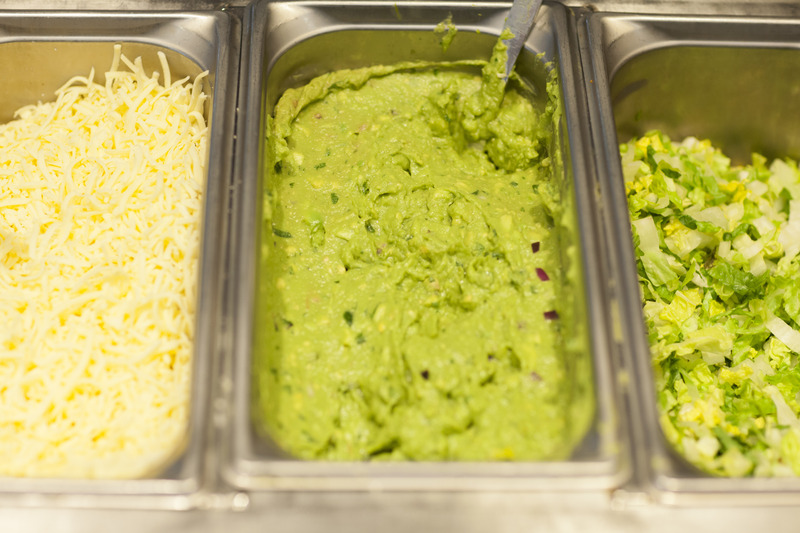 The bottom line is, Chipotle gets it when it comes to cheese. Everything in the fridge has been prepared that morning with the exception of the medium salsa which was in plastic bags. Due to the seasonal lack of tomatillos needed for the salsa, the store needed to source the salsa from outside suppliers. There is no freezer in the kitchen and no microwave. 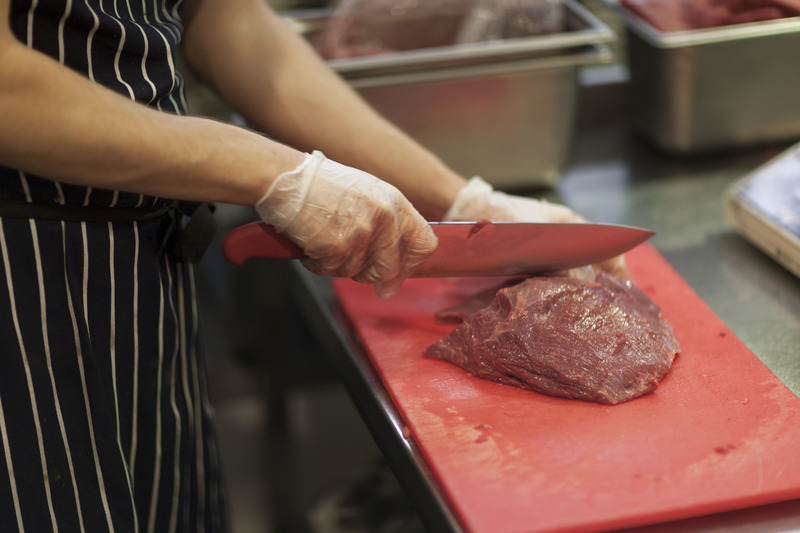 With fresh meat and ingredients being delivered every single morning, there is no need for either. 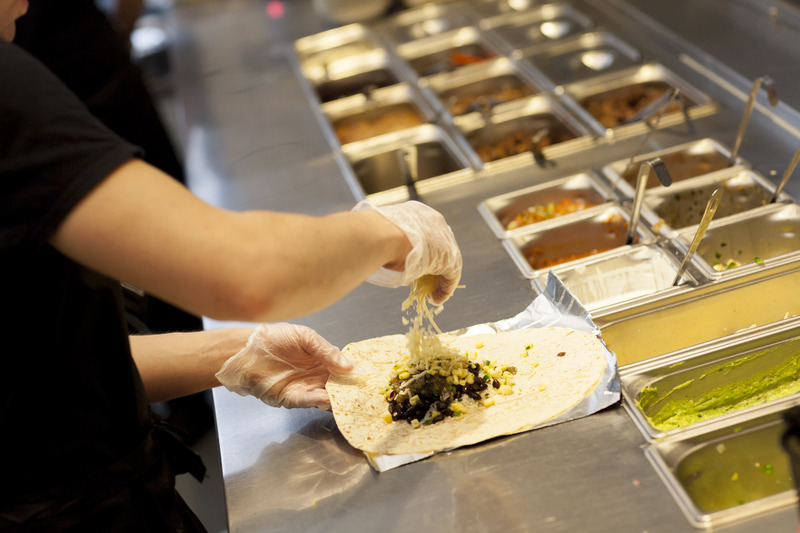 Chipotle has a strict 2 hour rule on all their food – if something has been sitting out for 2 hours they change it out. 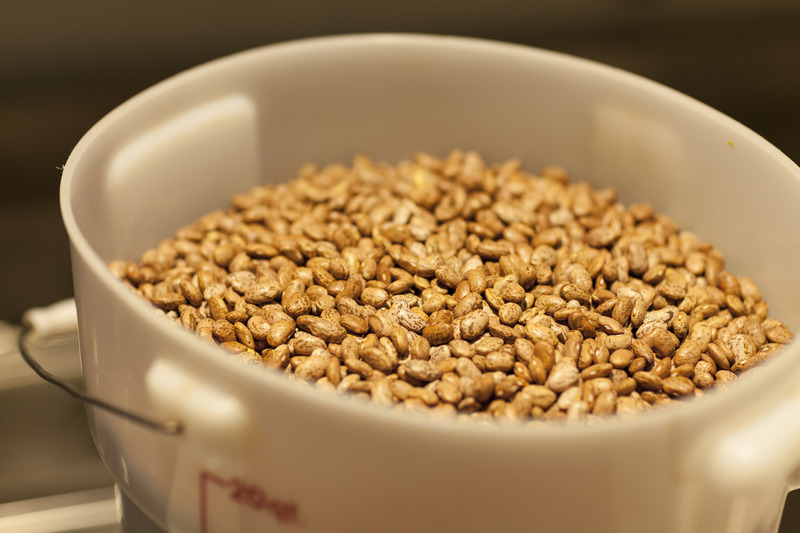 No compromising on quality. 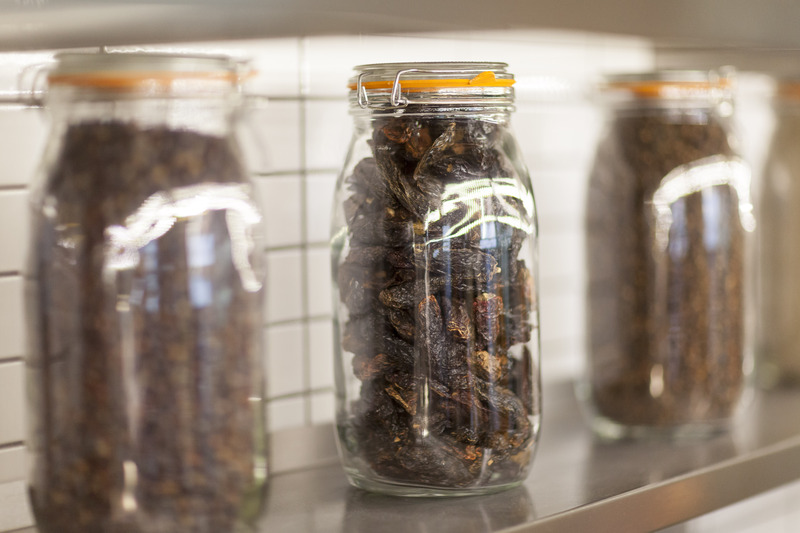 And what’s the best way to ensure quality and freshness throughout the day? Tasting! Staff members taste the food approximately every 20 minutes to ensure the meat hasn’t dried out, nothing has gone soggy, etc. 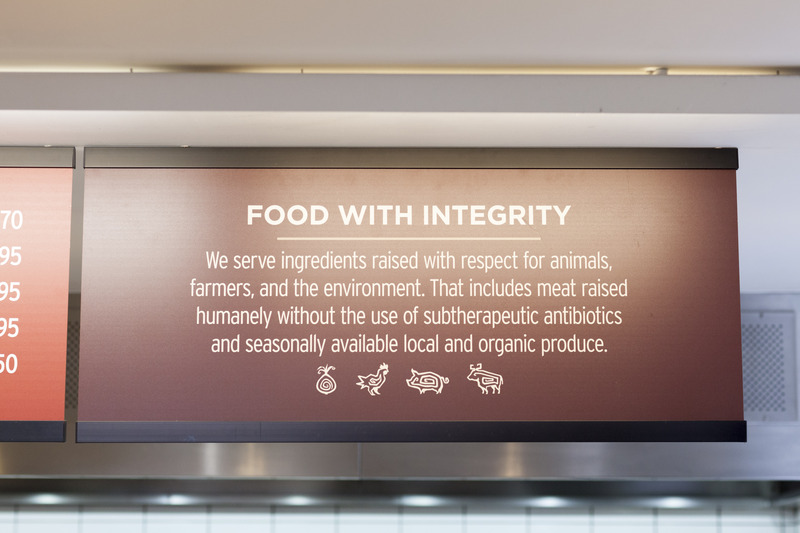 As part of the ‘Food with Integrity’ motto, all food is cooked right out in the open – Chipotle wants it to be known they have nothing to hide. 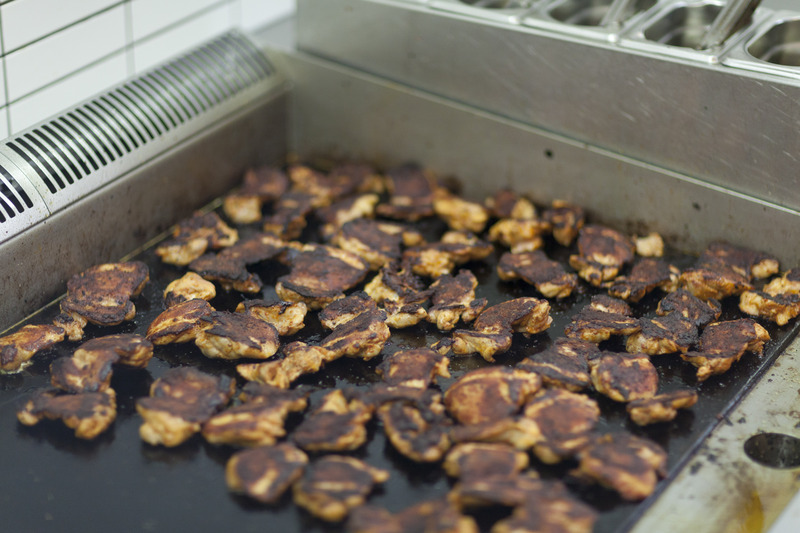 The guacamole really is made on premises, and the chicken is cooked before your eyes, chopped up, and put straight in the serving trays. I didn’t forget about my Vegan friends either (there’s a picture of some nice peppers for you)- Vegan customers can have everything on the assembly line except sour cream, cheese or pinto beans, which are marinated in bacon. Anna shows me the jars of spices which make for lovely decorations but are actually used in the cooking process as well. 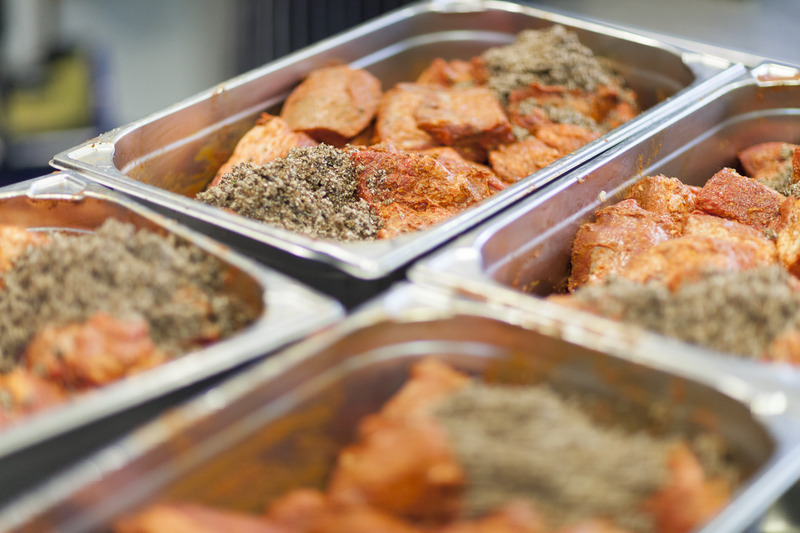 Black pepper, cumin, chipotle peppers (the spice that gives the restaurant its name), chile de arbol, and chilli peppers are all easily accessible for marinating and flavoring purposes. 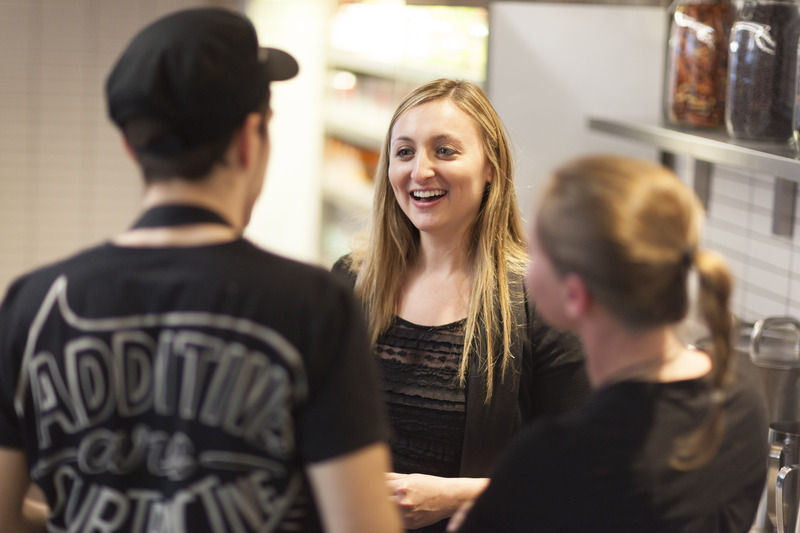 After the tour, I grill (no pun intended) Anna a bit more on the business, the brand and the awesomeness that is Chipotle..
Is there anything new on the pipeline coming through? A: The menu is going to stay the same I think. The menu has been working for 10 years now so there’s no plans to add anything new to the menu right now. A: There are a couple of things on the menu in the States we don’t have here. Pico de gallo in the States we are trying to bring it here – it’s hard to find the nice, hard tomatoes to do that though. Chipotle in the States is now required to post calorie information on menus and the website – has this had any noticeable effect (if any) on what people order or on the business in general? A: The information is on the website, but I never had a request from a customer for calorie information. Somebody might ask what a lighter option is and I’ll tell them to get the salad but they never ask for the calorie information. Why did they open a Chipotle on Wardour Street so close to this (Charing Cross Road) one instead of expanding into East London or West London? A: I cannot really share this information with you. A: We have one store in Paris and another one opening up there. We also have plans to go to Germany. What has been your craziest request from a customer? A: Sometimes people want us to use the tortilla steamer to make quesadillas for them – put the cheese right in the wrap and grill it. But we can’t do that if we’re busy! Were there any problems when you first opened in the UK? A: When Chipotle opened the UK people thought it was really expensive – then they came to appreciate the free range meat and everything is fresh so it’s worth it. Also getting people to see that we’re not fast food. How do you respond to people who say Chipotle is just another fast food chain? 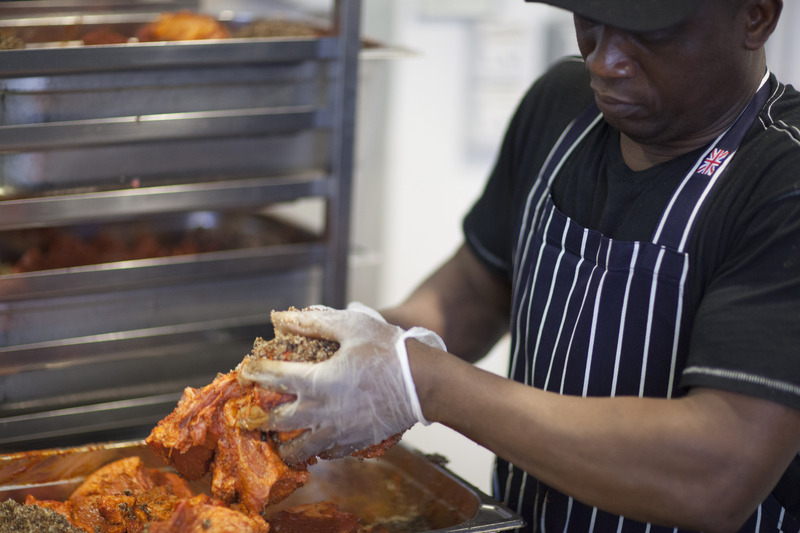 Has the ‘food with integrity’ campaign helped bring in a lot of customers? A: We don’t take anything outside, no posters or anything like that. We do all marketing in the store – mostly through good customer service. At the end of the ‘interview’ Anna shows me pictures from her visit to the pig farm that supplies Chipotle’s carnitas. 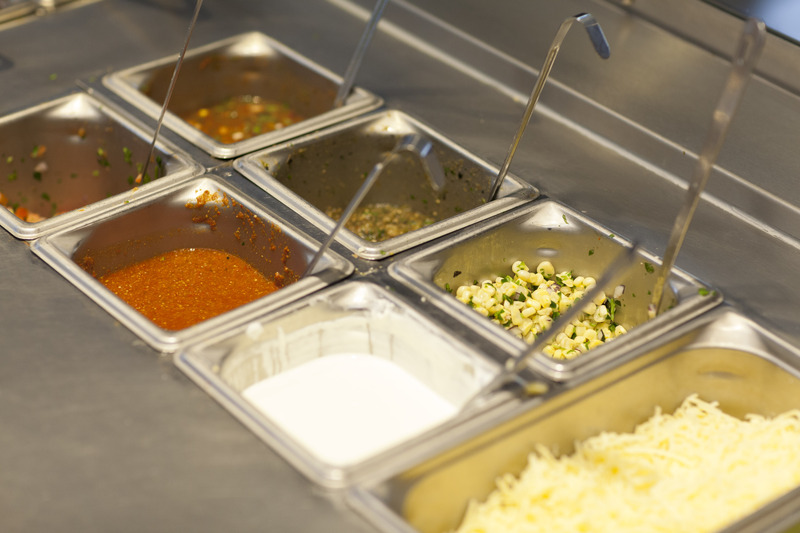 Chipotle has a main supplier for each type of meat they serve and then they have backup suppliers for each one. All the meat is ‘farm assured’ meaning it is completely traceable back to whichever farm it came from. This way, Chipotle knows exactly where everything has come from so they won’t have a horsemeat-esque scandal on their hands. The UK doesn’t have its own headquarters yet so the HQ in the States plays a big role in selecting the suppliers in the UK. Chipotle no longer stands alone in the ‘Improved Fast Food’ world with contenders springing up all over the place. More and more people are expressing concern about G.M.O.s, additives, pesticides and animal welfare nowadays. The queues out the door, the high revenue (last year’s sales approached $3 billion), and the insane popularity of Chipotle corroborate this change in attitude. Despite numerous competitors, Chipotle will undoubtedly have a long life span. Posted in Restaurant Reviews - LondonTagged burrito, cheese, Chipotle, Chipotle Mexican Grill, Fast Casual, London, Mark Bittman, Mexican cuisine, NYTimesBookmark the permalink.